According to a brief biography written by Kit and Morgan Benson, not much is known about the musician, actor and architect, Fernand Arbelot. 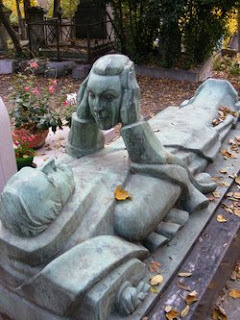 However, he has left quite a legacy in the form of a very unique tomb, located in Paris' Pere Lachaise Cemetery. The tomb depicts a man lying on his back, holding up a disembodied HEAD and gazing into its cold, stone eyes. An epitaph reads, "They were amazed at the beautiful journey which led them to the end of life." Sources say that the stone is the work of Belgian sculptor, Adolphe Wansart, and completed in 1946, four years after Arbelot's death. Arbelot was born in 1880 and a Parisian newspaper ran an obituary for him on November 19, 1942. Again, very little information was given, other than that he was serving as a director in the Westminster Bank. Legend states that Arbelot's wish behind the tomb design was to gaze upon the beautiful face of his wife for all eternity. Some unsubstantiated claims indicate that he sped that desire along by killing her before taking his own life in a murder-suicide that would give Romeo and Juliet a run for their money. What IS known is that Arbelot passed away during the Nazi occupation of Paris, a very dark period of time in French history---and while not much is known about his life, his name will forever be known, thanks to a VERY unusual piece of funerary art.